This is the card I am on about.. I tried the Android image and the Cubieez image and CubieBoard2 not booting them. I copied them using Win32 Disk Imager,PhoenixCard_V3 and even Etcher but it still not booting just the red light,I looked at the sd cards in Mini Tools Partition Wizard and it don't even look like there is a partition on them,just says unallocated but can see it split the 8 GB sd card into 3 partition,one says Fat32 the other 2 are unallocated,I have 2 sd cards one is only 2GB and the other is 8 GB and have tried both of them so I don't know what to do next. No support for Cubieboard then,this forum is dead,if you don't get support for the boards then they will not sell.No wonder people use the Raspberry PI more.it's a lot easier to use.and its cheaper,£35 RPI3 Support CB2 £50 No Support.Anyway..
image of CARD0 insert CARD2,system will not start. as the data memory card will be identified." Is Cubileboard from China or something.. Crap Support and crap instructions that don't make sense. I wish I bought CB2 with NAND Flash now,these are crap don't buy them,they are too hard to get going. Well good news I managed to get Android on the screen but thats it,CubieBoards only like Sandisk micro sd cards,don't work with Kingston ones,Use a Kingston 8GB Micro sd card and did nothing at first then a red rectangle box came up and nothing else,then I tried a Sandisk 2 GB micro sd card,and it started to boot but stuck on Android logo so it must be cos its 2GB and it needs 4 GB and up,so I am going to try and Sandisk Ultra 32gb sd card and see if that works.It should,I hope.. I could never figure the C2-dualboard out. Always thought it was a special project for some big Hadoop customer (or other server farm) that they decided to commercialize. Nothing really supports it. No uboot for it from sunxi, unless you somehow boot both? Never really looked into it; never considered investing the money in one. Yes, this forum board is basically dead as is the Cubieboard mailing list. I still heavily use Cubies (2 and truck) with Fedora and Centos and now working with Nethserver to see it gets ported to Centos-armhfp. But I am one of the last repliers here. The Russian forum sometimes shows some activity. There are still problems with the Cubieboard5 and uboot from sunxi. Seems to be getting close. Maybe by Fedora 30 it will work. 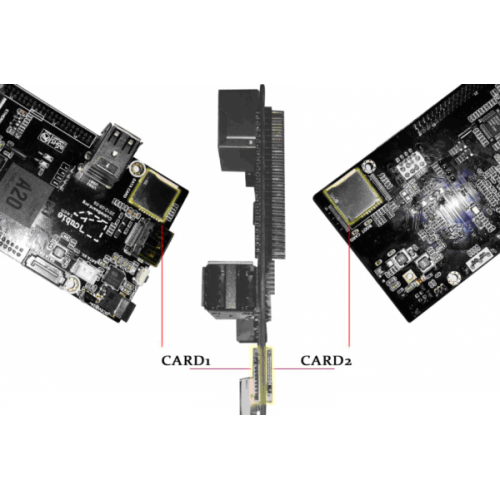 But then I have been considering a BananaPi based on the Allwinner R50 and find out that sata support for that chip won't happen until the 4.20 kernel (F29 is shipping with 4.18). So I can't even jump ships to get a working quad board! Also the Cubieboard5 is not native sata, but they emulate it off of USB and that is one of the problems. I have no problem using generic uSD cards I get at the counter of my local Micro Computer Center. But I use the Fedora installer, or direct dd of the provided Centos or Nethserver image onto a uSD card and take it from there. Hope you get what you have working well enough for you. Oh, one final note, if you will. The wonderful Mali GPU is not supported in the sunxi uboot. This means GTK3 goes into hw emulation mode and you get terrible graphics (read desktop gui) performance. I have been told GTK2 is dead. So Mali GPU is dead until someone contributes the needed code to the sunxi work. Thus great for servers, but not for desktops.